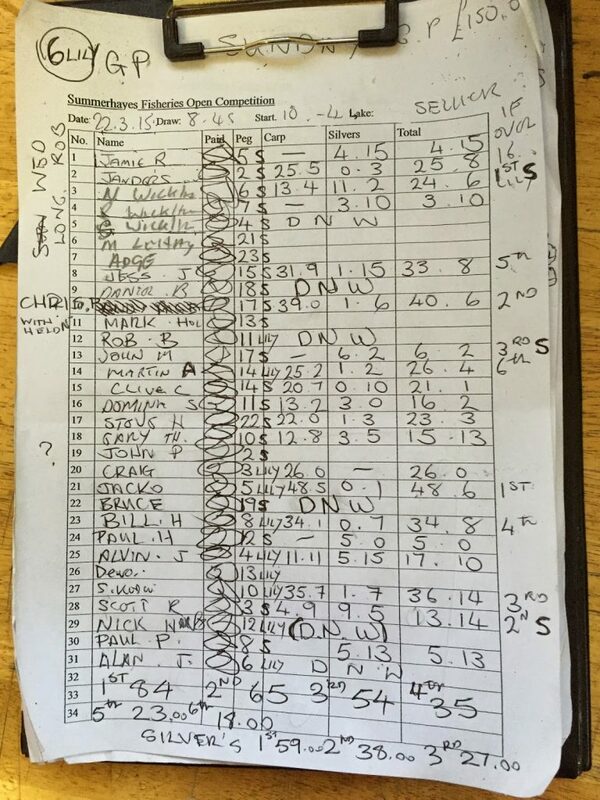 The match was due to be on Sellicks today but as always it depends on numbers and if there are more than sixteen anglers, Pete puts in several pegs on Lily. As me and Janders pulled into the car park, it was rammed! 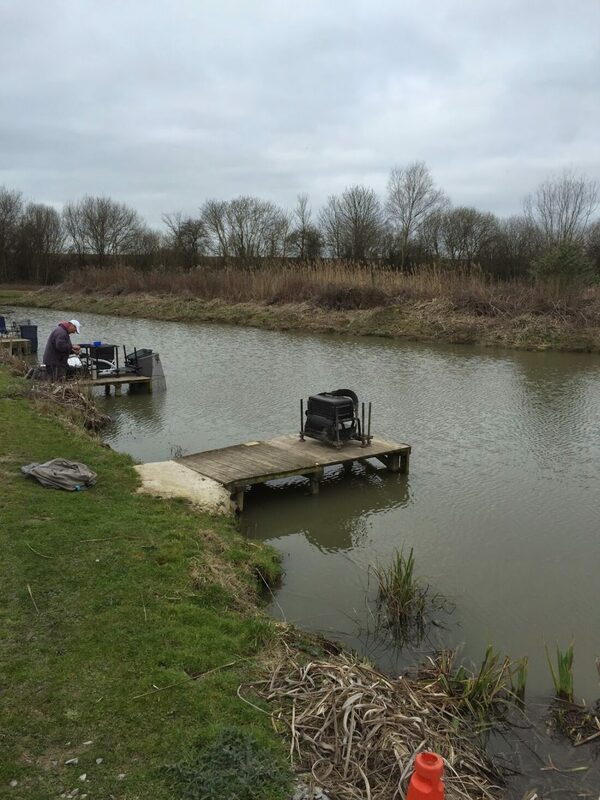 We soon found out that there were 31 anglers booked in for today which meant nearly all the pegs would have to be used on both ponds. Regular readers will know I’m not the biggest fan of Lily even though it regularly produces the winning weight. I just can’t seem to get on with it and was hoping I would be able to avoid it today. I hung back and when I stuck my hand in the bucket there were only two balls left, in a carbon copy of last week I grabbed one and then Scott had the last one. I couldn’t bring myself to look in case my ball had the horrible letter ‘L’ on it but when I’ve eventually had a peek, my home for the day was peg 5 on Sellicks, a great peg and one I’ve done well on for silvers before. Scott had pulled out peg 3 which is also a good peg but with nearly every peg in, nobody was really sure how it would fish especially as the pond had fished hard last week. Janders was on Lily on peg 2 and although it’s a good swim it’s normally known for carp rather than silvers which we had our pound side bet on. On that subject, Glynn Wickham paid me his nugget from last week and would be trying his hardest to get it back today. When I got to my peg, it turned out I was to be the meat in a Wickham sandwich with Glynn on peg 4 and Nigel on peg 6 and for good measure Ray was next door on peg 7. I set up two rigs today, a 0.4 gram Malman Pencil with 0.10mm bottom and size 18 Tubertini 808 and a 0.6 gram Drennan G-Tip with 0.12mm bottom and size 16 808. On the whistle I fed two lines at 10 metres and one at 5 metres with a third of a cup of micros on each before starting on the 10 metre line straight out in front with a 4mm expander on the hook. After a couple of minutes I had a bite which of course I missed, next chuck the float sailed away and I hit this one which turned out to be a decent skimmer. I missed the next three of four bites but I wasn’t too worried as at this early stage it felt like there were a lot of fish there. Nigel and Glynn were both fishing across and had lost foulhooked carp but other than that not a lot was happening. Typically my bites then just stopped and as the first hour drew to a close, I was just thinking about swapping lines when the float disappeared and I hooked what felt like a decent skimmer. I shipped back and as I unshipped at the top kit, the ‘skimmer’ woke up and I thought I’d hooked a small carp which wasn’t what I was after but when it surfaced it was a lovely crucian around 2lb which would be a proper bonus. It was nearly ready for netting when it dived and snagged me solid – great! I couldn’t shift it and reluctantly I’ve grabbed the elastic to pull the rig free when it moved and this time I got it in the net safely – yes! It was really hard going, Scotty had one small carp but had caught a couple of skimmers down the middle, Glynn had one small carp and Nigel had a carp and a few silvers fishing across. I wanted to leave my 5 metre line as long as possible before fishing it but bites were now very scarce on the longer line although I did add another skimmer. When I did come on the shorter line after a couple of hours I never had a touch despite the odd bubble coming up over the feed. There were also blows over the longer line and I was amazed at the lack of bites. I’d fed the longer right hand line very sparingly and had a few bites over it but couldn’t hit them. By the halfway point, I was on three skimmers and that crucian, Scott was now fishing for silvers and had six or seven skimmers, Glynn was struggling and only had one carp and one skimbob, Nigel had a couple of carp and was getting odd silvers and Ray looked to be catching some blades. My next action came when I’ve had a bite but didn’t connect with the fish until the float was half way out of the water, it was a decent skimmer and obviously foulhooked, I shipped back very gently only for it to come off at the net! I shipped out again and the same thing happened again and this one came off as well! Next chuck the floats buried again but this one was properly hooked and I safely netted it, this flurry of action proved to be a false dawn and I only added a 2oz blade over the next hour or so. Nigel was still getting the odd skimmer and had netted a couple of decent crucians as well, he would be in with a shout for the silvers and could possibly even frame as he had a few carp as well. Scott was now up to 12 or 13 skimmers and would be there or thereabouts too. Glynn was still struggling though and with around an hour to go, I was looking good to take another nugget off him. Although with bites now at a premium it would only take a couple of good skimmers for the pendulum to swing back in his favour. With only half an hour left, the float buried and the strike resulted in a good skimmer leap out of the water, my heart was in my mouth but the fish was still on, it leapt again and then on the third jump it shed the hook – gutted! That was the last of the action and I wasn’t too upset when the all out was called. I packed up and while I waited for the scales, Janders turned up and said he’d had ten carp but had lost twelve! He hadn’t had much in the way of silvers though and I was glad our bet wasn’t on overall weight as he’d battered me today. The scales soon arrived and John P in peg 2 didn’t bother weighing in, Scott’s silvers went 9lb 5oz which surprised me as I thought he had more than that, Glynn threw his couple of fish back and conceded the pound (but didn’t pay up again!). Then my modest catch went 4lb 15oz which I knew wouldn’t do any good today, also I couldn’t believe I hadn’t hooked a carp all day. Nigel’s carp went 13lb 4oz and his silvers weighed 11lb 2oz to take the lead. Ray’s silvers went 3lb 10oz so I hadn’t fared too badly against the Wickhams today. I loaded the car and with the weigh in completed it was back to the hut for coffee, crisps and the results. Jacko won again, this time with 48lb of small carp on the waggler from peg 5 on Lily and on the silvers front, Nigel took top spot with Scott second and Jon Martin was third with 6lb 2oz so that last skimmer had cost me and I’d actually probably missed/lost enough to have won the silvers! I felt really sorry for Janders today as he’d weighed 25lb 8oz and 26lb 4oz was last in the money and as he’d lost twelve carp he’d had enough on the hook to win the match. So Sellicks had fished quite hard again which is probably down to it still being pretty cold and having nearly every peg in hasn’t helped. Hopefully it’ll start to warm up over the next few weeks and the fishing will start to pick up and be more consistent. We’re back again next week and it’s hopefully on Longs unless there’s over twenty fishing in which case the Sellicks will be used as well with each lake having it’s own match. Hi Ivan, it will be nice to see you again, it's been a while!